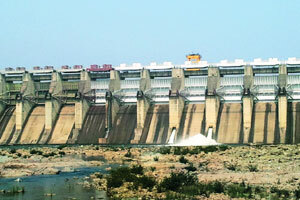 The Chandil dam is a part of Subernarekha Multipurpose project. It has been constructed on the river Subernarekha near a small town called Chandil in Jharkhand state of India. The project is a tripartite initiative among the three eastern states, Jharkhand (earlier Bihar, West Bengal, and Orissa). The dam is about 720.10 meter long (of which earth part is of 300.10 meter long and the concrete part is of 420 meters long) and 56.5 meter height. The dam has a total storage capacity of 1963 hm3 . The project’s main dam is located at Chandil and another reservoir is located at Icha, while two more barrages at Gauldih and Kharkai. The aim of this project is not only for irrigation for these three states but also for electricity generation . For the project purpose land was acquired from local inhabitants, and construction started in 1982-83. However, the project works stopped in many occasion due to the opposition to land acquisition by the land owners. Also, forest clearance was not granted because the project is located in the forest areas. There were also complains of corruption and the lack of funds. The agitations by the land owners started since 1972, when the project was initially conceptualized. In January, 1979 thousands of tribal, hold protest demonstration at the dam site. Police fired bullets to the agitating protestors resulted to deaths of four individuals. Since then, villagers are repeatedly protesting for rehabilitation and compensation to the concerned authorities . About 52 villages are submerged every year during the monsoon, when the water level of the dam rises. Generally, villagers are relocated in temporary makeshift arrangements. Local administration sometimes posted notices in villages likely to be submerged during the monsoons. This provided the impetus for the villagers to approach the Supreme Court. The protest got a momentum after the formation of an organization called Visthapiti Mukti Vahini (VMV). VMV is working for the causes of the dam oustees and have challenged the rehabilitation of people displaced by the Chandil dam in the Supreme Court of India in 1992. The petitioners have challenged the Land Acquisition Act and asked for rehabilitation and resettlement packages [3,4]. Project Details Subernarekha Multipurpose project spanned along the three states i.e Jharkhand, West Bengal and Orissa. The major dam of the Subernarekha Multipurpose project is located at Chandil in Seraikela Kharsawan districts of Jharkhand. The Chandil dam has storage capacity of 1963 hm3 and live storage of 1611 hm3 at MWL/FRL 192 m. The storage includes flood storage of 463 hm3 to benefit Orissa and West Bengal . The construction of Chandil dam & Galudih barrage are completed. The Power house with capacity of 8 MW (2 units of 4 MW each) is to be constructed at the Left Bank outlet of Chandil dam. Kharkhai barrage has not started yet and the works of Icha dam is almost completed. Irrigation potential of about 2200 hectares has been created . Development of Alternatives Since 1987, the organization Visthapit Mukti Vahini has been struggling for adequate compensation for the displaced . Why? Explain briefly. Following the protests, the compensation package has been increased for 12,000 families that were not adequately compensated and 2200 people got jobs in different government departments . With the mass protests and continued agitation by the Visthapit Mukti Vahini (VMV) government has also forced to lower the height of the dam . Still, massive displacement occurred and cash compensation cannot easily pay off the loss.